This week I attended the inaugural Fullerton Forum in Singapore, hosted by the International Institute of Strategic Studies, who described it as the ‘Sherpa’s meeting’ for the Shangri-La Dialogue at the end of May . The organisers requested the content of the meeting be confidential, but it was kicked off with a public keynote presentation from Dr Ng Eng Hen , Singapore’s Minister for Defence. His speech, on Potential Threats to Regional Stability in Asia, is worth reading because it highlights the breadth of challenges facing the region and the serious limits to capacity which hampers coherent regional responses. I am glad that Secretary Kerry acknowledges this—he said during his Senate confirmation hearing that strengthening the US-China relationship was crucial, and also expressed hope that China would recognise the need to broaden the bilateral relationship. He also expressed caution about an over-militarisation of the US footprint in the region, noting that ‘we [the US] have to be thoughtful about how we go forward’. … to forward deploy up to four littoral combat ships (LCS) to Singapore. The LCS will be deployed on a rotational basis and will not be based in Singapore. The deployment of the LCS signals the U.S.commitment to the region and enhances its ability to train and engage with regional partners. [Then US Defence Secretary] Panetta and Ng also agreed to increase the complexity of existing bilateral exercises, such as Exercise Commando Sling, to enhance interoperability and promote greater cooperation between both armed forces. 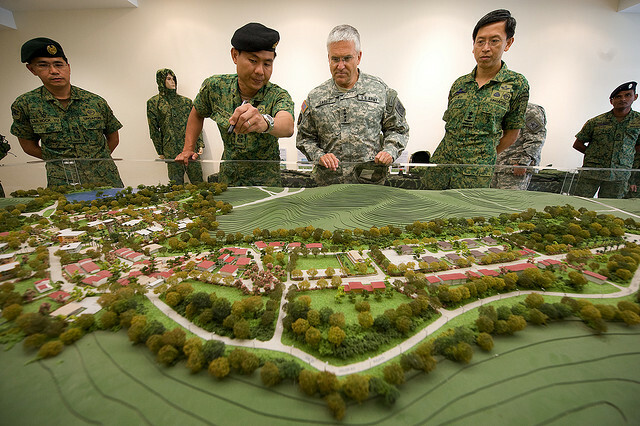 The US–Singapore bilateral defence relationship will continue to get closer, not least through key technology acquisitions—Singapore for example has been a ‘security cooperation partner’ on the Joint Strike Fighter project  for some years. No part of that developing relationship was covered in Dr Ng’s speech, but even in ASEAN actions speak louder than words. The Defence Minister’s second response to ‘shifting dependencies’ was to point to the importance of multilateralism as offering ways to build regional ‘confidence and capacity’. He highlighted the ASEAN Defence Minister’s Plus Meeting indicating that the grouping would be ‘conducting its first 18-nation exercise in Brunei this year, based on the themes of Humanitarian Assistance and Disaster Relief (HADR), and Military Medicine’. That exercise is a worthwhile endeavour and the achievements of ADMM+ are to be celebrated, but the exercise itself will be more valuable for its public effect than military training. In one very sad respect all it demonstrates is the complete incapacity of the region’s security architecture to deal with the growing strategic risks we face. A final, perhaps uniquely Singaporean highlight from the speech was what Dr Ng referred to as a second source of potential instability: ‘we are witnessing greater polarization within and across countries’. Here the speech focuses on rising nationalism, growing wealth divides within countries, religious extremism and ‘the inability of local governments to act quickly or plan for the longer term’. The Minister was talking about the wider region, but surely there’s at least a hint there of the anxiety Singapore’s long-ruling People’s Action Party must feel as it looks at the country’s demographics and changing attitudes to politics. Peter Jennings is executive director of the Australian Strategic Policy Institute. Image courtesy of Flickr user US Department of Defense .